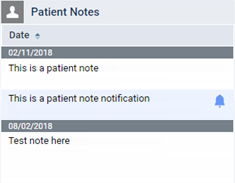 You can edit a patient note as needed. On the Notes tab of a patient's Patient Information page, click (or tap) a note's Edit button . The Edit Notes dialog box appears. If necessary, select a different Date to associate with the note. 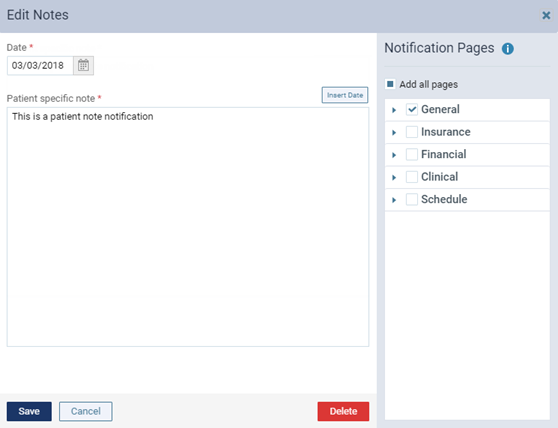 In the Patient specific note field, change or add to the existing note. This note will appear in the Patient Notes box of the patient's Overview page. The note can be up to 5000 characters long. To remove the notification from all available areas, clear the Add all pages check box. To remove the notification from all pages in a category, clear the check box of the category. To remove the notification from an individual page within a category, expand the category, and then clear the check box of the page. Note: From the Edit Notes dialog box, you can also delete the note by clicking (or tapping) Delete.